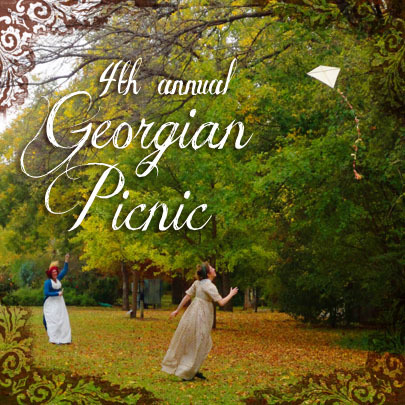 I was lucky enough to be able to attend the Dallas Forth Worth Costume Guild's Georgian picnic. We had a gorgeous day and everyone looked wonderful. It was so fun to see new and old friends, and especially to meet Merja, who came all the way out from Finland. Lesa took this one and we liked the watercolor effect the blurriness gave it. I (poorly) photoshopped out the cars and building. Wow! The costumes are amazing! I want them! Oh, you guys got SO many good pictures! Do you mind if I steal some? I'll credit you. There are some really amazing ones of you - that chemise gown and hat were fabulous and really suited you! It was wonderful seeing you again too! Thanks for the flickr links! So much gorgeous all in on place! It looks like the weather was beautiful, as well as all the ladies in attendance. Everyone looks utterly perfect! So wonderful! Everyone looks so lovey and what beautiful weather you had. So much fun! Looks like you ladies had a wonderful time! You are definitely lucky to have picnic-worthy weather this time of the year where this took place! Very beautiful, all of you. It was a gorgeous day! Thank you! You looked gorgeous in the striped dress. It glowed so beautifully in the sunlight. The fabric is so pretty and it fitted you perfectly. I had a serious case of stripe envy. Sorry, this comment got stuck in the moderation queue! Thank you so much for your kind compliments! You looked amazing too - I loved your outfit - and the "witch" hat!